Talent is often a major barrier of organizational growth because it involves managing the growth and personalities of your workforce. So what can stakeholders do when New Hire Nancy doesn’t have a handle on the company culture? Or when Salesman Steve is behind schedule in learning about new products and services? They can start by giving an employee makeover. 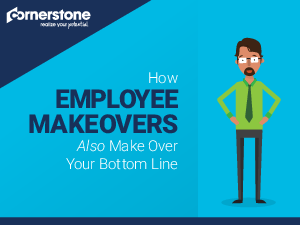 Download How Employee Makeovers Also Make Over Your Bottom Line and learn how making over disengaged or lower performing employees can help create a powerhouse workforce and drive financial growth. Your employees want to make an impact starting on their first day. Feeling like their company isn’t invested in them leads to employees that are more engaged with job hunting sites than with their current jobs. Read it today!